Apologies if this image is one of those which you find a little scary - I could have put the Potter's Wheel picture instead, but this is the one I associate with loss of TV programmes! I have been somewhat quiet over the last week, partly because I was having one of those blogging moments where I didn't know what to talk about. Having decided to get inspiration in the garden, I duly took some photos and was going to load them when disaster struck - search where I might, I couldn't locate my camera USB cable! I know when I last had it, but cannot find it anywhere (much to my annoyance). Having spent a few hours in fruitless searching, I have now ordered another one, but until it arrives, I am stuck. So, normal service will be resumed once my new cable arrives and yes, I know that as soon as it does, I'll find the original one! Well, would you believe it? About an hour ago, Chris moved some books on the table (bear in mind we had looked on the table, of course) and there was the missing camera cable, looking as though it hadn't made us spend a good part of the day looking for it at all! So, success in that I can get back to posting. How very, very frustrating for you. I hope the cable arrives/materialises soon. Thanks, Joy. I would say typical, really, but at least I can upload photos again. Have a lovely Sunday too! Thanks, Joy. It's a good idea and I have a feeling I will be keeping a watchful eye on that pesky cord (or should that be both pesky cords) in the future! The 'finding it after I've ordered a replacement thing' always happens to me too. Sooo frustrating ... I feel your pain. Thanks, Annie. As I am getting older, my attitude towards such irritating little things is improving. I managed to remain calm through the fruitless searching and today can say 'Oh well', accompanied by a shrug of the shoulders! (It's still annoying though) Hmm, my zen-like resignation didn't seem to last long...! Thanks, Alison. It's just typical, isn't it? 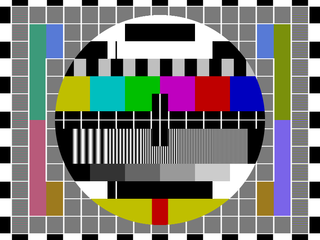 That test card picture with the girl and the clown also features in my childhood memories too.